A vertical bicolor of green and white with the red crescent encircling the red five-pointed star centered along the dividing line. As above, with white crossed fouled anchors in the canton. The national flag of Algeria ( Arabic: علم الجزائر‎, translit. ʿalam al-jazāʾir, Berber languages: ⴰⵛⴻⵏⵢⴰⵍ ⵏ ⴷⵣⴰⵢⴻⵔ, translit. Acenyal n Dzayer ) consists of two equal vertical bars, green and white, charged in the center with a red star and crescent, a symbol of Islam as the nation's prominent faith. The flag was adopted on 3 July 1962. 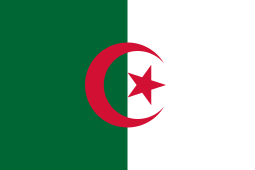 A similar version was used by the Algerian government in exile from 1958–1962. The Western blazon is per pale vert and argent; a crescent and star gules. 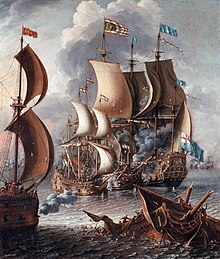 A Sea Fight with Barbary Corsairs by Laureys a Castro, c. 1681. Note the various flags with crescents used by the pirates. The Barbary pirates of Ottoman Algeria between the 15th and 17th century widely used flags that were emblazoned with one or more crescents. These could however vary greatly in color, with dark red, black, green and white being in use. Besides these, Algerian pirates also used various flags in plain color, such as plain black ones signalling death. Less often, Algerian flags of this time also carried other motifs, such as suns, stars and crossed swords. It is also known that Algiers used an orange flag with a white horizontal sword on it by the early 19th century. Émilie Busquant is perhaps best known as the creator of the Algerian flag. While there is some dispute over who exactly designed green and white with red star and crescent symbol, Busquant is generally credited as having sewed the first version of the flag in 1934. Algerian ships fly it as their ensign, except for ships of the Algerian National Navy, which use one charged with two white crossed anchors in the canton as the naval ensign. Formerly, the two crossed anchors in the canton were red. The green must be a composition of equal yellow and blue having, according to the diagram of contrasts of Rood, a wavelength of 5,411 [ångströms] and the position 600 on the normal spectrum. The red must be pure, of primary non-decomposable colour, and exempt of blue and yellow having, according to the above-indicated diagram, a wavelength of 6,562 [ångströms] and the position 285 on the normal spectrum. ^ Konstam (2016), pp. 34–37, 40, 43, 52, 56, 57 61. ^ Konstam (2016), p. 61. ^ "Google Livres". books.google.fr. Retrieved 2019-04-22. ^ "Thanh-Tâm Lê, 2 January 1999 (crwflags.com)". 1999. Retrieved 2016-06-15. Konstam, Angus (2016). The Barbary Pirates. 15th–17th Centuries. Oxford: Osprey Publishing. ISBN 978-1-4728-1543-9. This page was last edited on 22 April 2019, at 20:20 (UTC).